– Ronald Reagan, quoted in Time, May 17, 1976. – Ronald Reagan, campaign speech, 1980. – Ronald Reagan, Los Angeles Times, October 20, 1965. – Ronald Reagan, Los Angeles Times, June 17, 1966. – Ronald Reagan, TV speech, October 27, 1964. 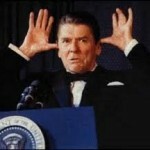 – Ronald Reagan, defending himself against charges of callousness on Good Morning America, January 31, 1984. 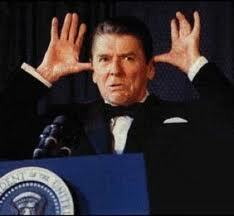 – Ronald Reagan revealing a disturbing view about the “coming of Armageddon,” December 6, 1983. This entry was posted in 2012 Election, Bizarre But Real, Christopublicans, Conservatives, Humor, Quotes, Religion, Republicans, Teabaggers, Wingnuts, WTF? and tagged GOP Presidential Candidates, Michele Bachmann, Nutcase Quotes, Ronalld Reagan, Sarah Palin. Bookmark the permalink.